I’ve only owned a waffle iron for about a year, but I can tell you that in such a brief amount of time I’ve grown to love it deeply and madly. Lately, it’s sincerely become my absolute favorite toy in the kitchen. And, you better believe I’ve been having tons of fun planning at least one meal a week around it! In fact, I find myself getting all giddy when it’s time to pour batter onto that perfectly patterned iron. And, you know what? You may be right. But, I stay really busy with baking cookies for work, assisting with 3rd grade homework and cleaning up the constant, relentless trail of destruction created by my toddler girl (seriously, she's the most adorable little maniac and I made her!) and it's really a chore to go out much. So, until the reinforcements (A.K.A my husband, Evan) return in June, I'm completely content to keep everyone confined spend most of my time at home hanging out with my kids and my kitchen gadgets. That pretty much describes my kinda paradise anyway. In the last few weeks, we've enjoyed some traditional Belgian waffles with maple syrup, and some spicy, savory waffles made with jalapenos and cheese. 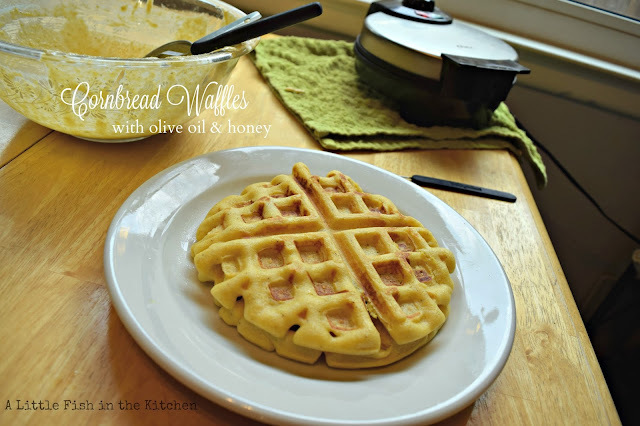 Both turned out delicious and those jalapeno-cheese waffles were perfect topped with some buttery, scrambled eggs! I've made these yummy corn bread waffles with olive oil and honey a few times now and they are definitely my favorites so far. I've served them up as a dessert with a sweet topping, my strawberry balsamic jam (which is going to be my next post! ), and as dinner dish with my favorite, slow-cooker turkey chili (that recipe is coming up too). And, these hearty waffles worked perfectly both ways. Just so you know, my kids won't eat a single, square slice of traditional corn bread. But, when I made the same honey-sweetened corn bread recipe I've been making for years in the form of a waffle it was a total game-changer! For once, the the nine-year-old and his three-year-old counterpart both agreed that these were "awesome". I choose to keep on celebrating these small victories. 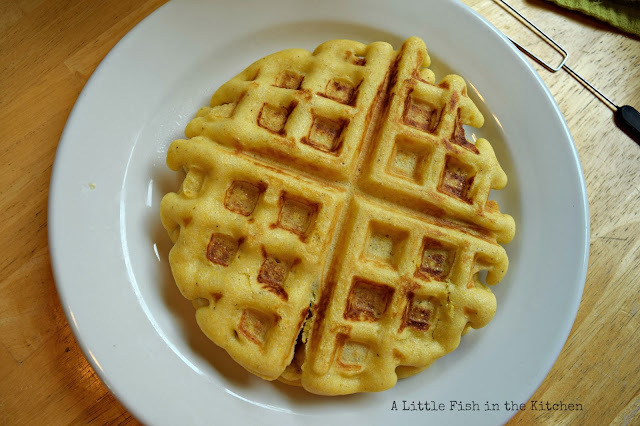 I hope you get a chance to enjoy some of these versatile, cornbread waffles too. 1. Combine the dry ingredients in a large bowl and set aside. In a smaller bowl, combine the egg, buttermilk, olive oil and honey. 2. 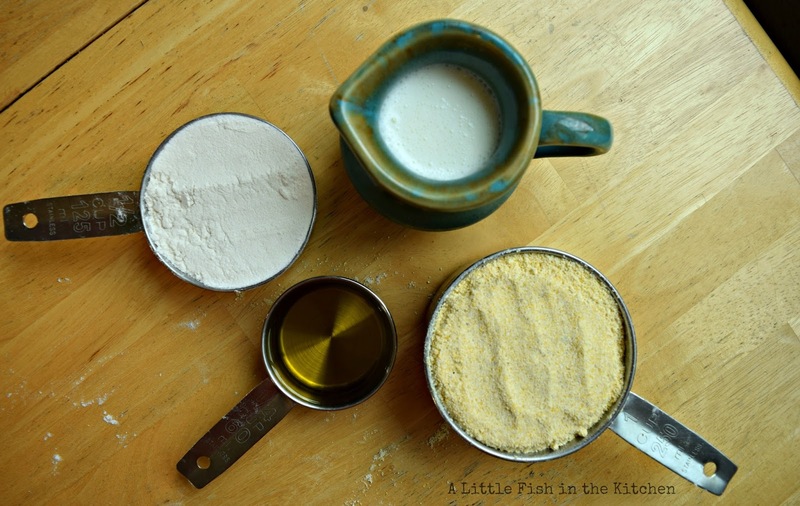 Make a well in the center of the dry ingredients and pour in the wet ingredients. 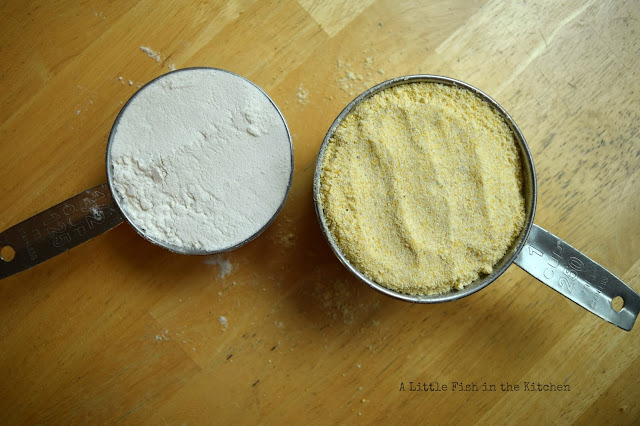 Using a wooden spoon, stir together all ingredients until well-mixed, mash any lumps of cornmeal in the mix to make a smooth batter. 3. 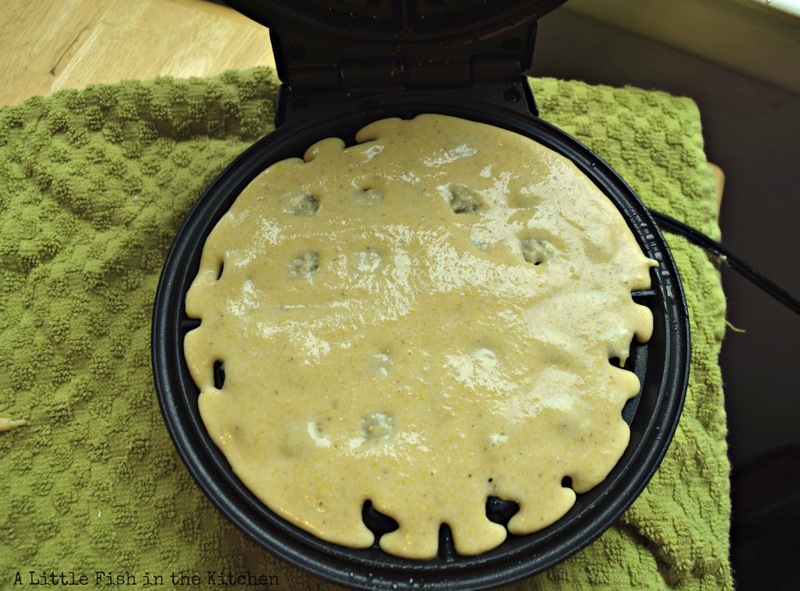 Pre-heat your waffle iron until it is ready to use. 4. I used a round waffle iron with an 8-inch baking surface, and I used a heaping, ½ cup of batter to make my waffles. How much batter you have to use may vary based on your waffle iron. But, you should use enough batter to cover the baking surface, but don’t over-fill it! 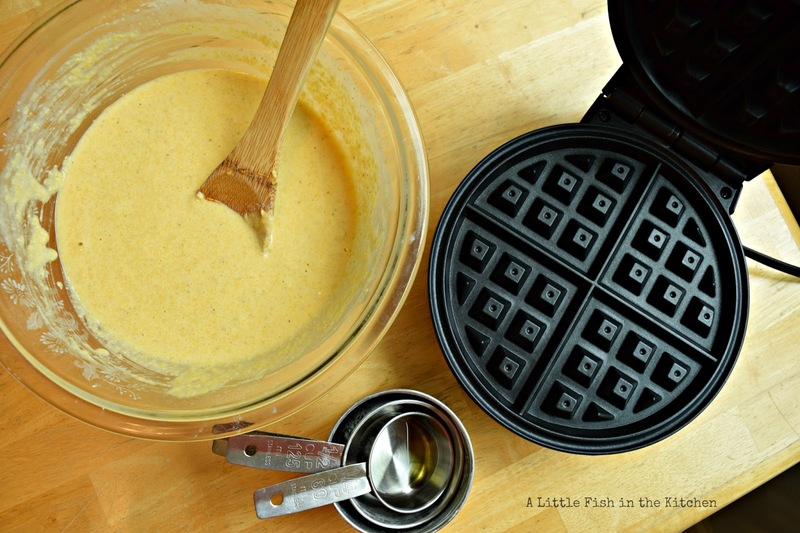 4.Close the waffle iron and cook until the waffle is lightly browned on the outside and appears done, about 4 minutes. Serve warm with your favorite sweet or savory toppings or as the bread portion of your meal. They look delicious! I would serve these with some pineapple/mango salsa for a light lunch. I absolutely love using olive oil in baking. It is my go to anymore. I don't think the flavor is overpowering, but really adds something. Lovely waffles. I am with you - waffles are fabulous. I only have a stove top waffle pan and want to graduate to the electric version like my mum has. These waffles look amazing. Hello there! If you ask me, I believe an electric one is well worth buying. :) Thank you, we sure enjoy them! Mark has been asking for savory waffles a lot lately... I love that you use this recipe for chili! We have to try it! Just reading through your ingredients, I know this has to be good. I will surely bookmark it and bring out my waffle maker, it's been a while. Thanks for sharing the recipe. I totally remember what it's like to have a toddler around and just having had our 4 and 6-year-old grandsons for a long overnight weekend, I'm exhausted :) I actually made regular waffles for them for breakfast one day and I can't wait to try the cornbread version! They sound delicious, Marcelle! I really have to get a waffle iron! It does sound like a fun toy. And this is really creative. When I was a kid, my mom would make cornbread for lunch sometimes that we'd cover with maple syrup. This would be better! Fun recipe -- thanks. Dear Marcelle, around here I do not know anyone who does not own a waffle iron. We have eaten and enjoyed our share of waffles throughout our lives and I love them still, always will. Your cornbread version sounds delicious and looks wonderful! How wonderful that your kids really enjoy them as well.